PLANS: We meet again this year in conjunction with Jeff Evans’ Annual Fall Auction of EAPG & Other 19th Century Glass & Lighting. Jeff Evans will conduct an appraisal session on Wednesday from 1:00 pm to 4:00 pm at the auction gallery in Mt. Crawford (email for appointment). Our meeting will begin with a welcome reception at the Courtyard Marriott Harrisonburg on Wednesday evening. Jeff and Beverley Evans will host a pizza party at their home on Thursday evening and Jeff will conduct a “galley walk” on Friday morning (beginning at 10:00 am). A reception on Friday evening will be held at the hotel. The auctions will occupy three sessions—Thursday (beginning at 10:00 am), Friday (beginning at 1:00 pm) and Saturday (beginning at 9:30 am). REGISTRATION: The registration fee is $35 per person. For additional information contact Jim Walters at 4479 Drifton Drive, Columbus, OH 43227-2532 (telephone 614-861-5808; email). 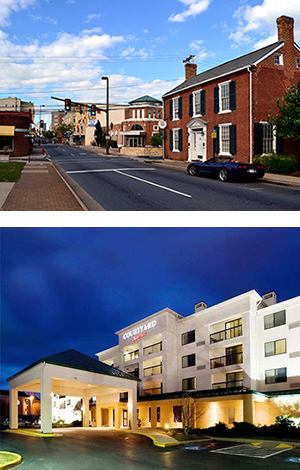 HOTEL: Reservations should be made directly with the Courtyard Marriott Harrisonburg (1890 Evelyn Byrd Ave., Harrisonburg, VA; telephone 540-432-3031). A block of rooms has been set aside for the meeting at the special rate of $119 per night (plus taxes). Book your hotel reservation before August 19, 2019 to receive the special rate. Be sure to mention the Early American Pattern Glass Society.